The Mountain Chalet is a cozy, one-bedroom, 1920's cabin decorated in a knotty pine/nautical-theme and is limited to 2 people. The deck has spectacular mountain views that can be enjoyed while using the BBQ on summer afternoons! This cabin is adjacent to The Nutcracker Inn, which could also be rented to increase your groups' sleeping capacity to 12. It is also located near Cabin 15 so several families could stay in the same area! Mt. Chalet is in a nice location that is very quiet and peaceful. It is a nice place for couples to escape in and enjoy the wilderness. It is within walking distance to several Wallowa Lake activities including gift shops, miniature golf, restaurants, go carts, and more! 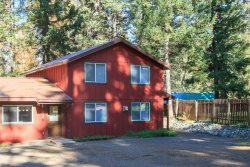 Come to this great 2 person cabin with your loved one and enjoy Wallowa Lake together!